Finally Metric Vs SAE Socket Holder Trays Color Coded display of a product that does not rely upon signage or the retailer for color identification. Yes, both the Red and Blue Trays are Socket Holders for 1/2” Drive Socket Wrenches. But the colors dramatically warn you there must be some difference, and the labeling says blue is Metric and red is SAE (Society of Automotive Engineers or English). Let’s just all be happy the 1/2 drive portion of the spec is English only. I’d hate to have to choose Metric or English Drive for Metric or English Socket Sets. At that point I’d opt for an adjustable crescent wrench. Outfitting is simple All-Wire Ball End Single Prong Display Hooks, which work equally well for both metric and SAE offerings … at least on this side of the Atlantic. 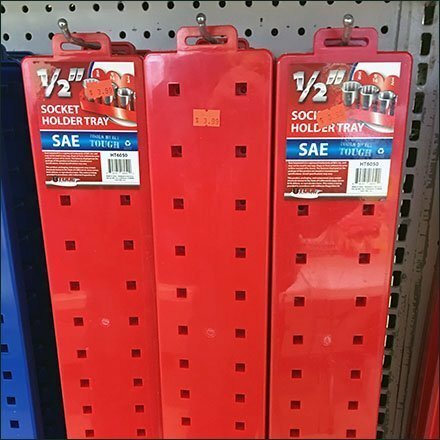 This Metric Vs SAE Socket Holder Trays Color Coded seen at Mark’s Wholesale deep discount retail.